THE HESLOP HOUSE: surgery, perms, and a marshmallow theif! surgery, perms, and a marshmallow theif! So I have been really not into blogging lately, partly because I have been so busy, summer does that to me, and partly because my face has been hurting ( yes, i know it kills most of you) so a few things have happened lately but i won't bore everyone, i'll try to keep it short and sweet. first, the surgeries went well, with a minor exception to me aspirating some blood when i woke up, having to have an overhead page for all these doctors to come running, a few hours of some heavy duty breathing treatments, and more blood throwing up, other than that all went well. sorry no photos for me, but taylor captured one while waiting for her turn and she looks so sweet. They made me soooo mad because they wouldn't give her any versed before she went in( the loopy juice so they don't have a hard time going back to the OR) because they said the procedure was too short and it would take her longer to wake up after; so of course she wouldn't go, so i walked her back as far as they would let me go, then i had to watch them rip my four year old from my clothing, kicking and screaming for mom to not let her go; the nurse that took her was getting slapped in the face pretty good and even got kicked a few times! Then I had to listen to her scream all the way back! And if that wasn't horrible enough, she remembers EVERYTHING!!! Down to them shoving a mask on her face on the table to make her go to sleep! 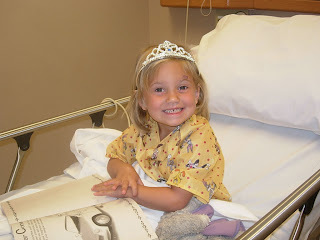 I don't care how long or short a procedure is, no child should have to go through that. I have been through many surgeries with conner, and they ALWAYS sedate him before he goes back. To say the least I have yet to fill out my comment card. On a lighter note, Taylor got a perm! Her hair is sooo fine and it just won't hold curl, even the perm didn't take very well, oh well, still looks cute. she was a doll too, just sat there and handed me the rods while she colored, she was a good sport about all the rinsing too! yeah for taylor! For our last event, over the last couple of weeks we have had a marshmallow thief! originally, i was blaming this all on taylor, conner doesn't eat mallows, she kept reassuring me it wasn't her, but she was the only culprit in mind, until one day, ah haw! 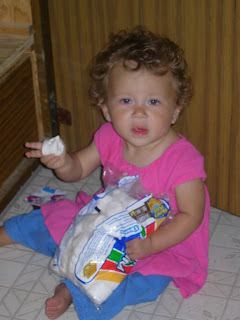 i caught her, red handed, in the drawer, mallow stuffed in mouth! At first I didn't believe my eyes, how on earth could this happen, but later that day i witnessed the whole job in action. 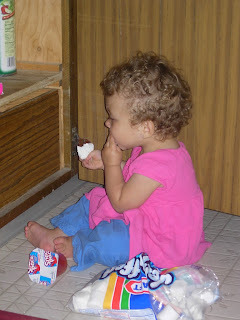 our dear sweet presley gets the door opened, which isn't hard, digs for the mallows, they are in the back, she takes the clip off, yes i witnessed this, digs for a mallow, shoves it in her mouth and quickly crawls away, leaving the mess. I was mortified, and felt horrible for blaming it on taylor. i had no idea presley was capable of such a task, but after I witnessed this event of hers, which by the way has been going on for weeks, i will have to be more on the lookout of who i target the mess with. i guess I have to learn to not let that curly hair fool me! So lessons learned: ALWAYS demand versed for surgery, don't trust the girl with the cute curly hair, and definitely buy smaller mallows! 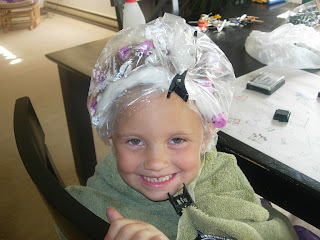 ditto on the not trusting girls with curly hair!! So what kind of surgery did you have to have? Your girls are adorbale by the way. Oh I totally forgot why I left a comment in the first place. You have been tagged read my blog and follow the instructions. I have been thinking about you and your TERRIFYING ordeal, don't play it down Jenica! Choking on BLOOD?!?!! I caught some of the story from Bethany, but we need to get together. I am sad that I have been gone and missed playgroup, AGAIN! I can't believe Presley could get the clip off the marshmallow bag...that takes some talent. Man, I feel like I haven't seen you in forever. Next time I see you I'd better have a baby with me because as of right now I am STILL pregnant! Wow, sounds like things have been crazy for you!! What kind of surgery, if you don't mind me asking??? Sounds like it was a scary ordeal. I've also been thinking about doing that surgery. About 18 months ago my daughters lovely head broke my nose and ever since then I've been having issues. Nothing huge but I seemed to get stuffed up a whole lot more than I used to. I saw the Dr when the break happened and they said they'd do it, but I just don't know. What kind of down time did you have and would you recommend it? Hey Jenica!!! It is Tina "Ashby" Hackworth. I came across your blog and thought i would say hello. You have beautiful kids. I hope all is well.